Former Gala captain Richie Gray is taking up a two-year coaching contract with South Africa. The 44-year-old Scot will act as breakdown consultant, having made an impact in the role last year. 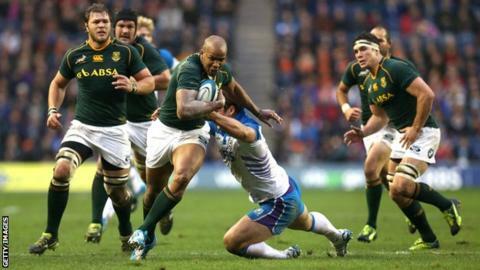 The Springboks' rucking technique improved markedly during the 2013 Rugby Championship and their autumn tour. "It's a big job, looking at the breakdown area. It fits into pretty much the whole plan in attack and defence," Gray told BBC Scotland. South Africa are the number two side in the IRB rankings and Gray, who spent 12 years working for the Scottish Rugby Union, will be a vital part of the backroom team aiming for World Cup success in England next year. "[Head coach] Heyneke Meyer targeted that area to work on last year," he added. "The South Africans are huge men with a phenomenal mauling, line-out and scrummaging game but maybe one area they were slightly weaker in was, breakdown-wise, body height, coping at that level. "There is always huge pressure to do well. You've got 50 million people and rugby is an absolute way of life. Sometimes, even when you win it's not good enough - you've got to win well. "It's been a real challenge but they have such great athletes right across the board."